Charles Wysocki was born in 1928 in Detroit, Michigan. From the time he was a little tot, he always wanted to be an artist. His father was an immigrant from Poland who worked on the assembly line at Ford Motor Co. for over 35 years. His father was not thrilled about his son’s artistic aspirations. Most of his encouragement came from his mother. She fully supported his artistic tendencies. Charles went to high school at Cass Technical High School and focused on their art program. For a time he worked as an apprentice in Detroit art studios. Then Uncle Sam snatched him up. Charles was drafted in 1950 during the Korean War. He should have been sent to Korea where he may have met his fate, but right before he was to be sent out, he was granted a leave of absence to visit his brother Harry who was very ill. After he returned to hook up with his unit, the powers that be said, “You’re going to Germany.” He was stationed in Hanau, West Germany from 1951-1952. After his two-year obligation in the Army he decided to trade in his rifle for a paintbrush. After leaving the Army, Charles attended Art Center in Los Angeles (it is now in Pasadena) on the G.I. Bill. After completing his studies, and majoring in design and advertising illustration, Charles joined the staff of freelance artists at McNamera Brothers in Detroit in 1955. He lived at home with his parents during this time. Charles moved to Los Angeles in 1959. There he formed an advertising agency with three other artists called “Group West” and was very successful doing freelance commercial artwork. Some of his clients included General Tire, Unocal, Carnation, Chrysler, United California Bank, Otis elevator company, and Dow Chemical Co. to name a few. During this time he won numerous awards for his illustrative talents. Then he met Elizabeth, and she unleashed the primitive artist that was buried within him. Charles and Elizabeth met at an ad agency in Los Angeles. She had just graduated from UCLA as an art major. 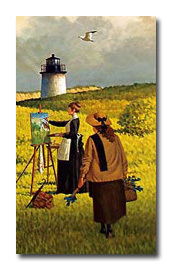 She was working at this ad agency when she heard about a hotshot illustrator (Charles Wysocki) that was coming in to do some freelance work for them. Well, when they met, it was love at first site. Elizabeth’s family was one of the first to settle in the San Fernando Valley. Charles was enamored of the simplicity of this farm life and wholesome values. This influence is what started his whole primitive style that we all know and love. Charles and Elizabeth were married three months after they met, in July 1960. During this time they made several trips to the East Coast. They went antique shopping and visited places such as Nantucket, Martha’s Vineyard, Cape Cod, Boston, Vermont, New Hampshire, and Maine. In the early 1960’s Charles worked as a commercial artist, but his heart was in the primitive style. At night and on the weekends, he worked on his Americana/primitive paintings. After he did a one-man show at which he sold every painting in this style, he decided to leave commercial art for good and just focus on his Americana art. For most of the 1960’s he made a good living off of the original paintings he sold. He also published greeting cards and posters, along with licensed merchandise of all kinds. During this time Charles and Elizabeth had three children. David was born in 1965, Millicent in 1967, and Matthew in 1969. It is also during this time that they moved from Los Angeles to Lake Arrowhead. In 1979, Charles published his first limited edition print, “Fox Run”, with The Greenwich Workshop. His published numerous prints with them during this time from 1979-1993. He also traveled around the country and made personal appearances at galleries all over the United States. Charles won many awards for his work including the one he was most proud of, the medal of honor from the Daughters of the American Revolution, the society’s highest honor. Charles also published two books during this time, “An American Celebration” in 1985 and “Heartland” in 1993. He also appeared in People magazine July 7, 1986, and was invited to the White House Independence Day celebration in 1981 (for which he did a painting that still hangs there). Charles painted his whole life, and up to his death at the age of 73. He died July 29th, 2002 surrounded by family. It was also his 42nd wedding anniversary. He will be sorely missed by many, but his artwork will live on. He is survived by his wife, Elizabeth, his three children, David, Millie, Matt, and his two grandchildren, Emily and Jackson.